Every home needs electrical outlets. In fact, the National Electrical Code is very specific about how many should be in a room as well as where and what type they should be. When an outlet needs to be replaced or a new one needs to be added, a homeowner who is familiar with the basics of electrical wiring can do a power outlet installation. It helps to understand the anatomies of the two main types of 120-volt outlets you'll encounter, which are conventional duplex outlets and GFCI/AFCI outlets. Once you have this understanding, it's easy to do the wire connections. Just make sure you've turned off the breaker to the circuit on which you're working before you touch any wires. Most outlets – even GFCI/AFCI ones – are duplex, which means they have two interconnected receptacles. Some have two-prong inlets, which means they are polarized, and some have a third inlet for a ground pin. Both types have to be grounded, and they have a green ground screw for that purpose. On one side of the outlet, you'll see a pair of brass screws, and on the other side, you'll see a pair of chrome screws. The brass screws are hot and are the ones to which you connect black circuit wires. The chrome ones are neutral and are for white wires. Once you connect a live circuit cable to one pair of chrome and brass terminals (it doesn't matter which pair), both receptacles are energized as long as you don't cut the bonding plate between them. The remaining terminal pair is for downstream circuit devices if you're adding an electrical outlet in the middle of a runlet. 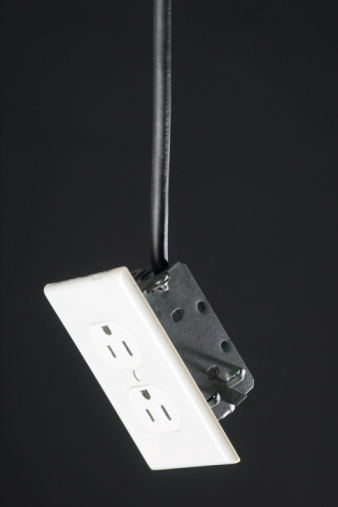 A GFCI outlet contains a circuit breaker that shuts off power when there is a ground fault. Similarly, an AFCI shuts off power when there is an arc fault. Manufacturers have begun to combine both functions into a single outlet, and the National Electrical Code requires these outlets in bathrooms, kitchens, laundry rooms and outside. These outlets also have four terminal screws and a ground, but one terminal pair is designated only for the live circuit wires and is labeled LINE. The other pair, labeled LOAD, is for daisy-chaining downstream devices. All outlets must be installed in an approved electrical box secured to a wall stud or, in some cases, to the drywall. In a typical end-of-run installation, you need one live circuit cable. It should be a 12-AWG, two-conductor cable, which means it has a white wire, a black one and a bare wire for ground. The ground wire isn't considered a conductor. For light-demand circuits controlled by a 15-amp breaker, it's permissible to use 14-gauge cable. If the outlet is in the middle of a circuit, a second cable will be in the box. It must be the same gauge as the live circuit cable. Once the rough-in has been completed by you or by an electrician, you're ready to hook up the outlet. Make sure to turn off the breaker for the circuit before you start making outlet connections. Even after turning off the breaker, it's a good practice to check each wire with a voltage tester to make sure it's dead before you touch it. Use a knife to strip 4 to 6 inches of sheathing from each cable in the box, and use wire strippers to remove about an inch of insulation from the tip of each wire. Connect the wires by making a clockwise bend in each one with pliers and hooking the wire to the screw terminal. That way, tightening the screw draws the wire closer to the screw and makes a more secure connection. If you're installing a 15-amp outlet with 14-gauge wire, you can also slip the wires into self-clamping holes behind the terminal screws. Connect the black circuit wire to one of the brass screws and the white wire from that cable to the chrome terminal across from it. If you're wiring a GFCI/AFCI, the live wire pair goes only on the LINE terminals. Connect the black and white wires feeding downstream devices to the other terminal pair. Finally, twist the bare ground wires together and connect them to the green ground screw on the outlet. Push the wires into the box, screw the outlet to the box, install a cover plate and you're done.